Registration for RooFriends 2018 Trick or Trot Is Now Open! Registration for the RooFriends Trick or Trot 5K Trail Run/ 1 Mile Fun Run is now open! 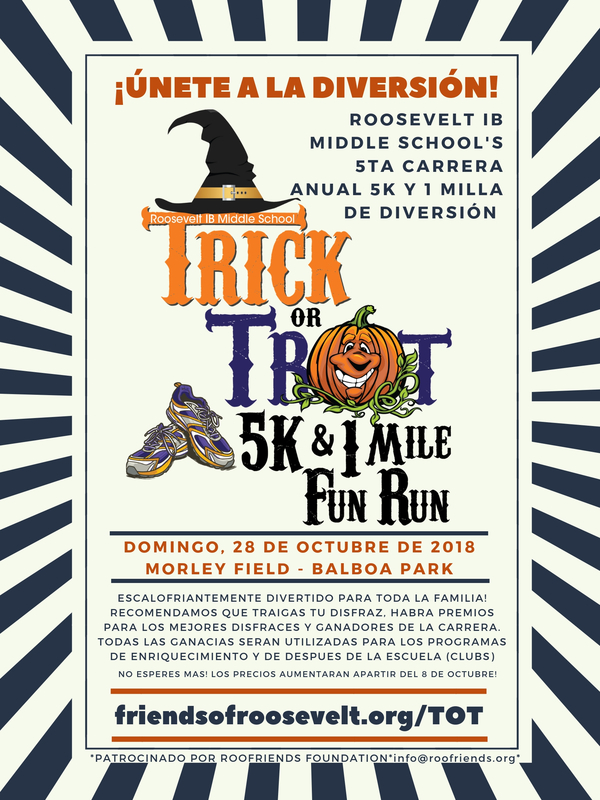 This fun event takes place in Morley Field, Balboa Park on Sunday, October 28th. Each year we encourage our students, parents, teachers, staff, and community members to join us and raise money for the After School Enrichment (ASE) Programs offered at the school. Costumes are encouraged! There will be FUN for the whole family! • Registration is ONLY $10/kids and $15/adults. Register BEFORE price increases on October 6th! • Trophies will be awarded for race winners as well as best costumes! • Face Painting, Pumpkin Decorating, a DJ and so much more! • 5K is a scenic trail run through Florida Canyon. • 1 Mile Fun Run takes you around the sports fields of Morley Field. Visit the Trick or Trot page to register and answer all of your questions. Would your business like to help sponsor this fun, family-friendly, healthy event? Please visit our Sponsor page.